Hello! I’m excited to be guesting on Trysh’s blog today! I’m Erika and I blog over at Erika, Eventually. I never really post about music on my blog, though I am a huge music fan, so I thought that Music Monday would be a fun way to get out of my blogging ‘box’! I can listen to generally any type of music, and so when I came across CATHEDRALS via a free download link via Twitter last year, I figured ‘alright, what do I have to lose?’ because free music = my favorite music. I wasn’t expecting to fall into my new obsession. It has been a long year with ups and downs, but CATHEDRALS has been the constant in my life. CATHEDRALS songs, though not always light and airy in content, are light and airy in sound. The vocals are so sharp and so crisp, and melodically, they are so fun to listen to. They are the perfect music for studying, having on at a party, etc. I don’t think that they’re going to pump you up during your workout, but that’s okay. They’re perfect for coming down off of that high. 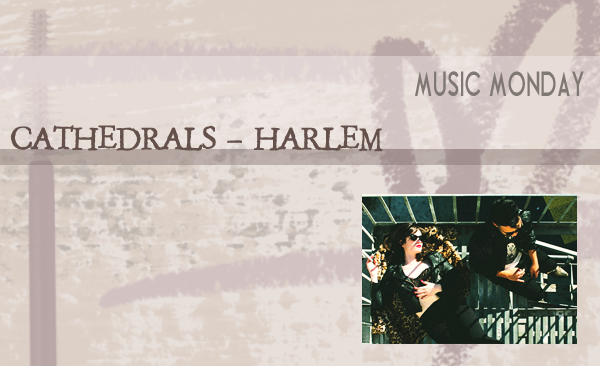 Harlem, my listening selection for you, is personally my favorite, though I love everything about their EP. I can’t wait to hear a full-length album!